In order to do the assignment, sometimes student’s own strength is not enough. This is because it often happens that no one really counts the workload: teachers are in a hurry to teach you everything they planned to teach you, as a result, you find yourself immured in academic paper walls. The best way to get out of the situation is to find a website that provides assistance in writing academic works. Our task is to show you the advantages and disadvantages of each of them. So, let us talk about Essayvikings.com. The site has chosen a funny title concept – the viking, riding a bear and cutting the air to deliver your academic work as quickly as possible. 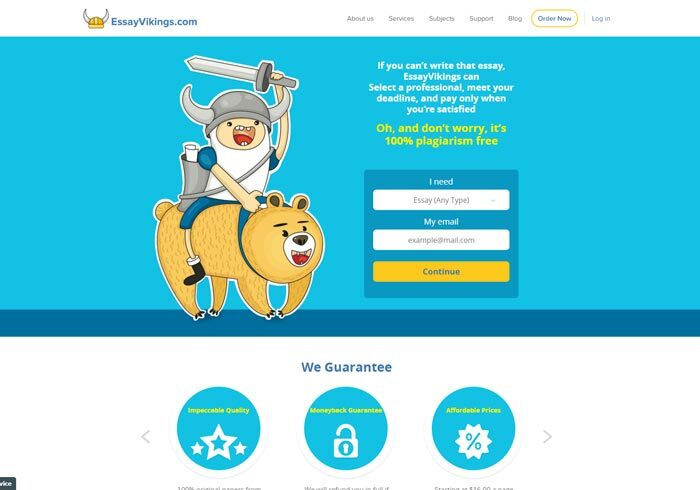 There are questions about why this is a bear and whether it is possible to saddle a bear, however, this is just a design decision and it is the view of the website developers. Information on current activity. The choice of the color scale is definitely their failure: the white text on the background is one of the most unwanted combinations, unreadable for the eye. For the same reasons, some aspects of the money back are not clear. According to Revision Policy and Money back statements, in case of the order cancellation, the company reserves the right to take a certain percentage of the cost for an author if it considers the reasons for the refusal to be insufficiently justified. What kind of percentage is involved and what is meant by "insufficient justification" – the information is not available. The ordering procedure on the site is built on the method of writer auction and self-selection. This scheme is rather ambiguous and has many pitfalls that cannot be avoided due to the freedom of communication between the client and the author. So, cooperation with the site requires careful reflection and analysis.